BC’s educational institutions generally fall into one of the following categories: K–12, Post-secondary and Language. BC is the top destination in Canada for international students in elementary and secondary (K-12) education. The province has an exceptional public education system: K-12 students consistently rank among the best in the world according to achievement tests such as the OECD PISA, a reliable global indicator on the performance of education systems. Both BC’s public school districts and independent schools have a long history of welcoming and supporting international students for short-term study, specialized summer camps, and longer-term studies culminating in the BC graduation certificate, the Dogwood diploma. Schools may also offer enriched curricula options such as the International Baccalaureate (IB) or Advanced Placement (AP). There are 60 public school districts in BC spread across large urban centres, small cities and towns, and beautiful rural areas. Independent schools are also located throughout the province and provide day programs as well as boarding options. Both public and independent schools are inspected and approved by the BC Ministry of Education. BC’s post-secondary education system is world-renowned for the incredible choice and flexibility it offers students. Our transfer system allows students to move from one institution to another while transferring credits. Our major research universities rank among the best in the world and our regionally based teaching universities rank among the best in Canada. And our colleges and institutes are famous for their diversity and quality of offerings. Offer four-year undergraduate degrees. They are located throughout the province, in both large cities and smaller regional centres. Research universities also offer a range of graduate degree programs at both the Masters and PhD levels. Deliver programs that prepare adult learners for further post-secondary studies and/or provide courses and programs in trades, vocational, career technical, and academic studies leading to certificates, diplomas, associate degrees and applied degrees. Many community college programs also allow students to transfer into university programs to complete an undergraduate degree. Career colleges offer shorter-term, career-focused certificate programs in specific areas of study. Accredited institutions may then apply for the EQA designation, a provincial seal of quality education. English as a Second Language (ESL) training is critical for many international students, and BC is the preferred destination for international students choosing Canada for ESL study. BC offers an exhaustive range of ESL programs throughout the province, from short one-week programs to extended academic and business English programs. In many cases, English training may be combined with academic study through a single institution or through two institutions by way of a pathway program. Students may complete their English-language study through one of BC’s public post-secondary institutions (university or college) or through one of the many language schools throughout the province. Certificate – normally involves up to one year of full-time study. Academic certificates are typically made up of 30 credits or about 10 courses. Diploma – normally involves two years of full-time study. Academic diplomas are usually made up of 60 credits or about 20 courses. Bachelor’s degree – normally requires four years of academic course work. The program structure is designed to have you gain both breadth and depth in your studies. It is common to gain specialization in one subject area through a Major or Honours program. Master’s degree – normally involves two years of full-time studies beyond an undergraduate degree. The degree offers you the opportunity to enhance knowledge and skills through a combination of course work and independent research under a faculty advisor. The research is presented in the form of a thesis. Doctoral degree – normally involves at least two years of study beyond a master’s degree. This degree is the highest level of academic achievement available to learners. It involves the completion of oral and written exams and original research presented in the form of a dissertation. 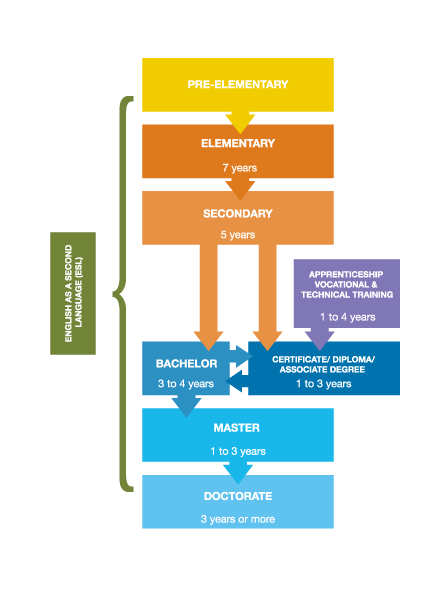 Below is an overview of the different study paths.